It was only yesterday that I was waxing lyrical about Sirsasana (headstand) in ‘Yoga Suits Her’. So perhaps you will think me fickle to be equally enthusiastic about another inversion. No matter. Sarvangasana is often referred to as “the Queen of Asanas” in the textbooks. She was always my scariest pose. I wasn’t worried about of falling out of it or my neck hurting. But I was very afraid of the long timings expected of the students in my teacher Martyn’s classes. 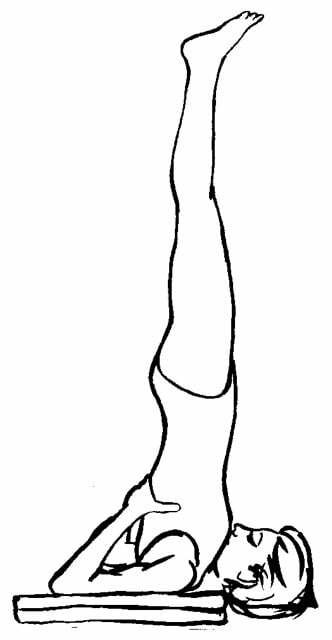 It was considered standard fare to do a 10 minute straight shoulderstand, followed by many variations, and a longish halasana (plough pose). Like a watched pot that seems to never boil, those long shoulderstands and halasanas were interminable. I would always find an extremely valid reason to come down before the timing was complete. I don’t know exactly when the tide turned in favour of doing shoulderstand, but turn it did. Maybe it was 30 years after I started yoga. Was I a masochist for hanging in there for so long? Or merely stubborn? It helped when I discovered supported shoulderstand and halasana. These are the user-friendly approaches to the standard unproved way of doing the poses. I’m so glad that I found better ways of doing the pose! I wouldn’t want to miss out on doing shoulderstand and halasana in my daily practice for anything now. They were some of the first yoga poses I took up again after my recent hip surgery when I got the all-clear from my specialist. I’ll just reiterate the bit of advice from the last blog about headstand. If you have trouble with the Queen, find an experienced teacher (or Donald Moyer’s book – Awakening the Inner Body) to help you over any hurdles. Eventually you might be like me, up-side down and purring away.